From Seward we drove up to Portage Valley and spent the night in a USFS campground near Portage Glacier. Enjoyed the displays at the visitor center but you can no longer see the Glacier from it as it has receded so much that it is now blocked by a hill. 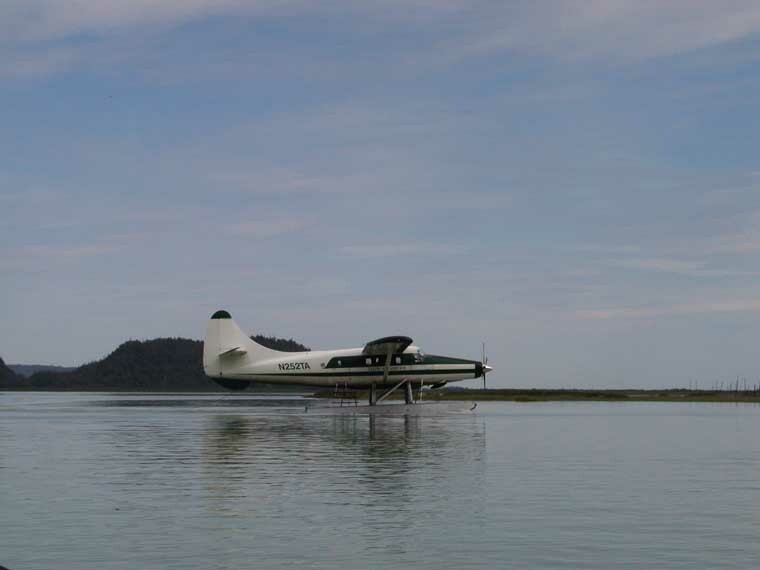 The only way to view it is from a boat cruise on Portage Lake or a hike from Wittier. Since there were heavy clouds hanging over the mountains we decided not to do either, having seen so many nice glaciers already. The next day we returned to Anchorage and got caught up on laundry, got film developed at Costco, got a much needed haircut and refueled the beast. Some long time friends from Germany were in town following a cruise so we spent a wonderful day visiting with them. Like us they enjoy walking so we all took a 3 mile hike at the Eagle River Nature Center which is part of Chugach State Park. That evening we enjoyed Margaritas and Carsons famous salmon bbq! We hope to visit them in Germany in a year or so. Meanwhile Steve and Robbie are traveling north for a few days hoping their daughter can get a glimpse of Mt. McKinley before heading back to Boston. 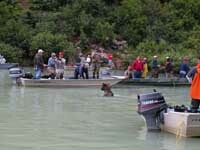 We are going back down to Soldotna for some fishing and bear viewing and will meet up with them in a few days. On the way down to Soldotna, we stopped for the night in Girdwood. 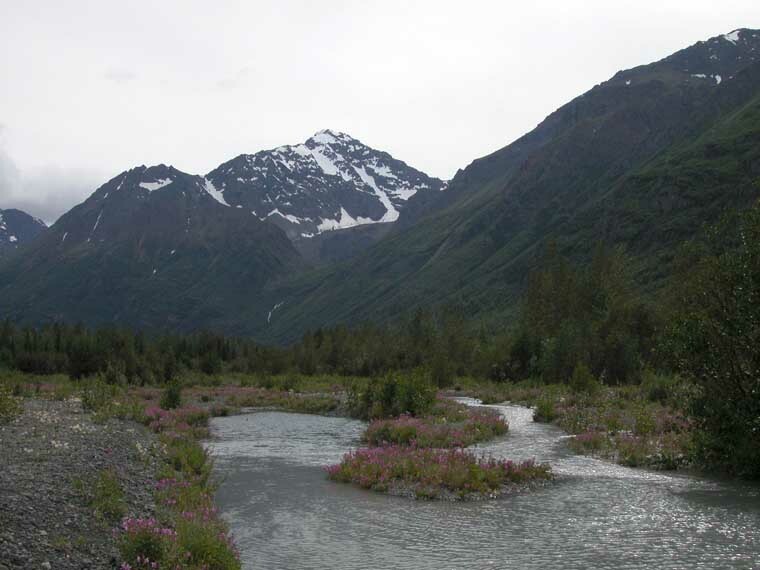 This is a small mountain town about 40 miles south of Anchorage. 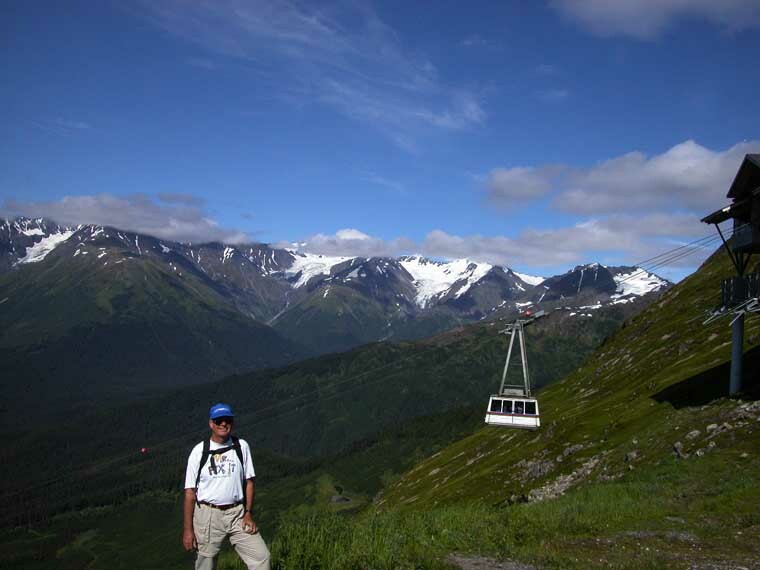 In the winter, its claim to fame is the Alyeska Ski Resort. In the summer, the tram takes visitors up the mountain for breathtaking views of the surrounding glaciers (7 in all) and hillsides. 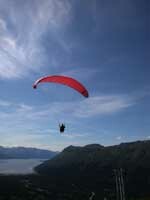 And if conditions are right you can watch para-gliders sailing off the top. We camped in the day skiers lot next to our friends Dan and Jeannine Wainwright. Dan happens to be a para-glider and we were fortunate to have a picture perfect day for sailing. 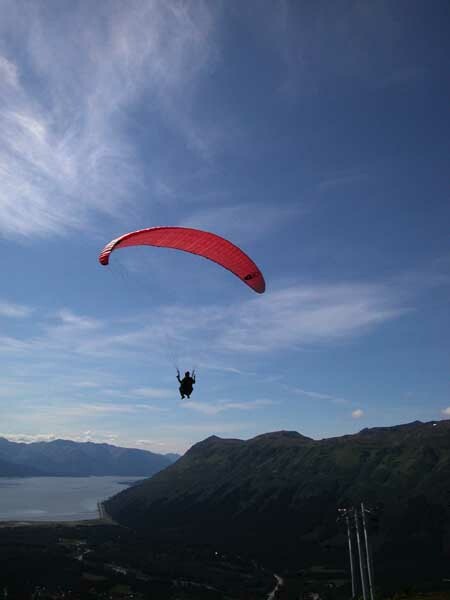 It was really fun watching Dan prepare his wing and then take off from the peak, catching thermals that lifted him even higher across the valley. Meanwhile Jeannine had gone blueberry picking that morning and was making a couple batches of jam. Later she showed us where the bushes were - a fairly steep climb half way up the hill. Fred picked us a nice bowl full. Had some in our pancakes the next morning. The rest we froze for later use - now that we have a little space in the freezer! Right now the red (sockeye) salmon are at their peak in the Kenai River so this place is an absolute zoo. Would you believe a couple days ago there were over 100,000 salmon that came up the river in one day? Everyone and their brother are here trying to catch their limit (3/day). The fishermen are lined up along the river hoping to snag one in the mouth with their fly rods as it swims by. If you snag it anywhere else, it has to be put back. You can really tell the people that know what they are doing - they are the ones with the fish! Fred went down for a couple hours after dinner and he saw a man wade in between two others, throw his line in a few times and within ½ hour had his 3. No one else caught any during that same time. But later Fred found a nice man who showed him a few tricks and lo and behold he pulled up a great one - enough for eight meals after it was filleted. 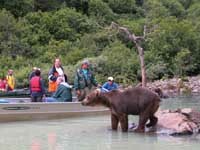 But the real reason we came back to the Soldotna area was for a bear viewing excursion. We had scheduled it for a couple weeks back but the company had cancelled the flight due to bad weather. We thought we had bombed out again as we woke up this morning to light rain on the roof. Fortunately the rain stopped and we were able to go. 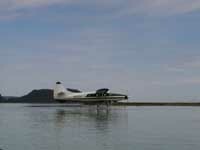 We took a 30 minute flight by sea plane across the Cook Inlet and landed on Big River Lake. 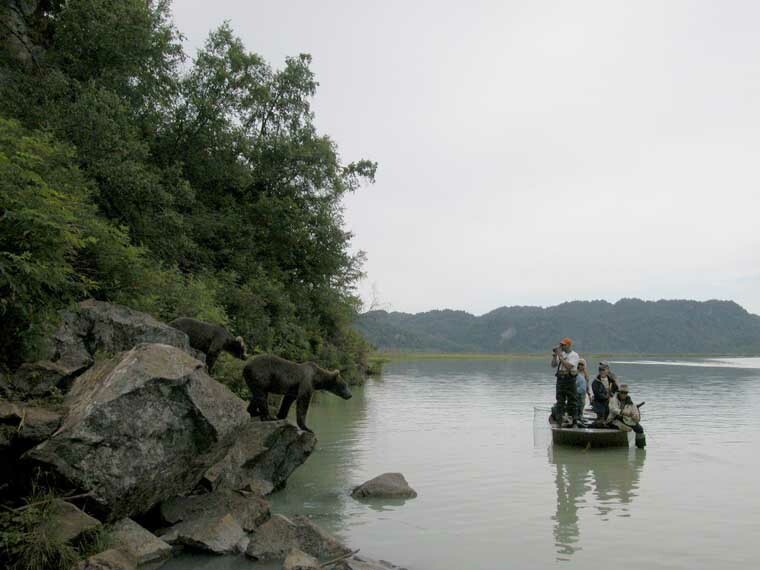 Then got into aluminum boats for a short ride to the mouth of Wolverine Creek. This is where the salmon gather to go up the creek to spawn. 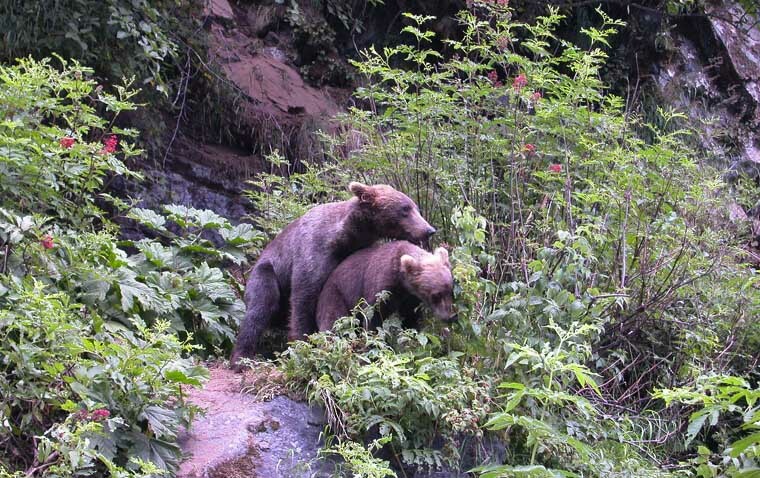 And this is where the bears also come to eat. What an amazing site! 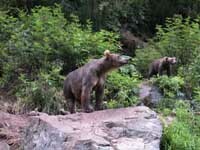 We saw a mother grizzly with her three 2 year old cubs and a 4 year old male cub. Most the time cubs leave their mother by age 3 so it was unusual to see a 4 year old, especially since it was still nursing. And then we watched it try to mate with one of the other cubs.At times these bears were less than 10 feet away from our boat. They seemed very unconcerned with all of us. 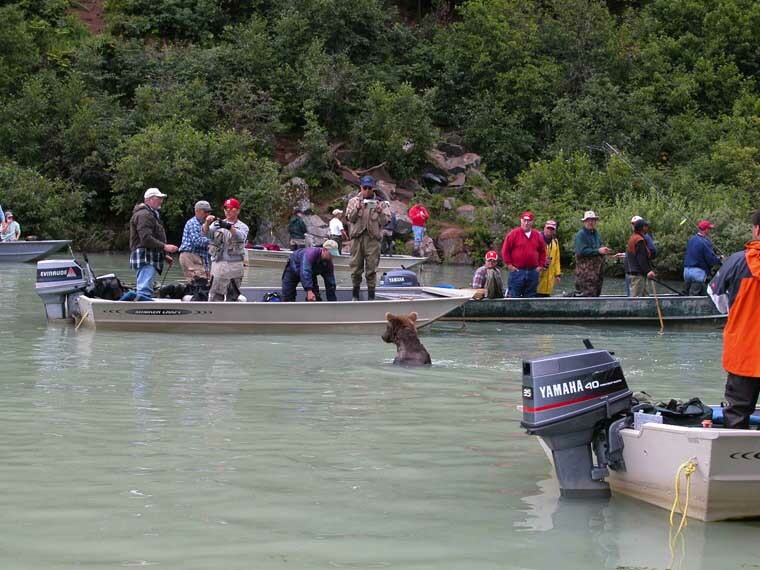 I wanted badly to get a photo of one with a salmon in its mouth but only once did we see a bear actually catch a salmon and then it was on the other side of the cove behind some other boats. But it was fun seeing them try to catch fish, jumping off the shore into the water and pouncing on the fish. When we weren't watching the bears, we were able to try to catch some salmon ourselves. 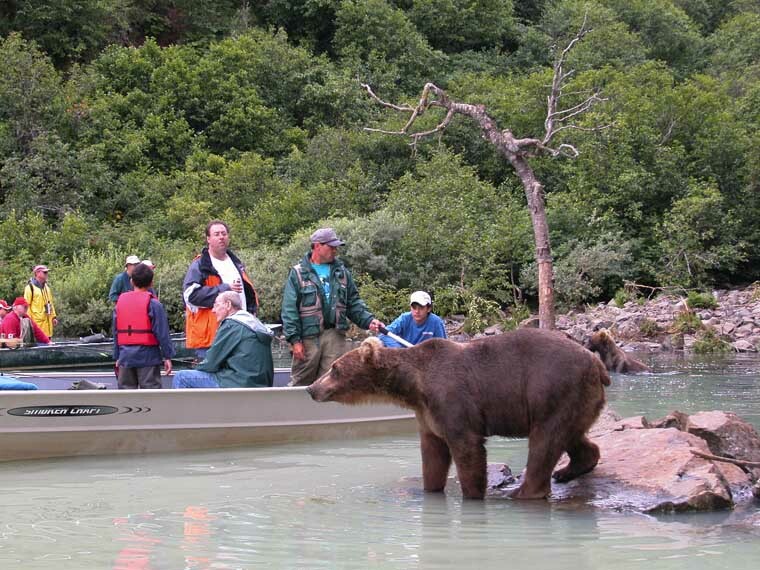 But everytime the bears came around, we had to quickly reel in so as to not hook a bear! Ended up with our limit of sockeyes which we've decided to trade in for some smoked salmon. Our 27 pounds of whole fish turned into 9.4 pounds of smoked. We got some lemon pepper, some Cajun and some hickory. Even after all that fishing we did today, Fred decided to join Jeannine and Dan down at the Kenai River after dinner and wouldn't you know he caught another red - 24inches. My freezer and ice maker are full again!